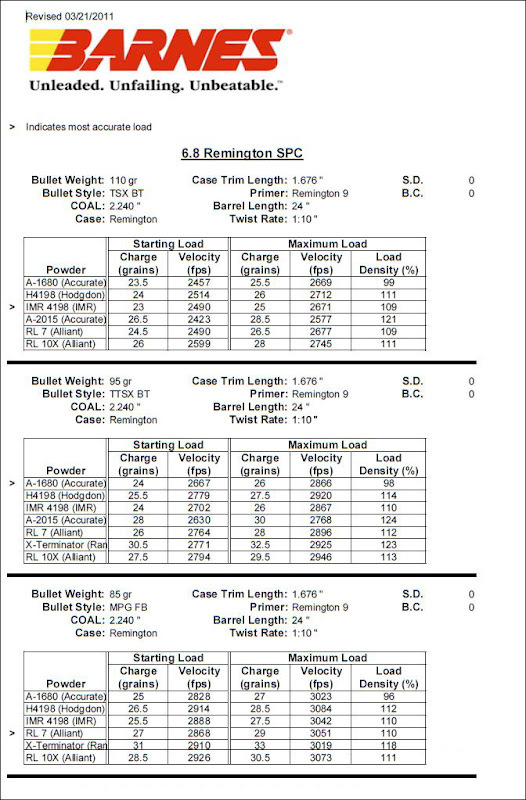 Does the latest Barnes Reloading Manual have any load data for 85gr TSX and 95gr TTSX? Can anyone post some of the info? Chambered, thanks for helping me out last time. that round is no slouch looking at those figures. Thanks, OV1. I'm trying to decide what powder to start with. I keep waivering between the 85 TSX and 95 TTSX bullets. I think the TTSX will open up faster. Accurate has a new double-based powder A2200 which has been producing much higher velocities than A2230 or A2015. I can probably use this to work up a forumla for A2200. The impressive part, Elvis, is you can get close to these velocities with a 16-18" barrel with the 1:11 twist and SPC SAMI II chamber. Need to stew some more. OV1, where did you get that data? The Barnes website still shows only data from 2008. Thanks, OV1. I found some additinal data in some of the links. 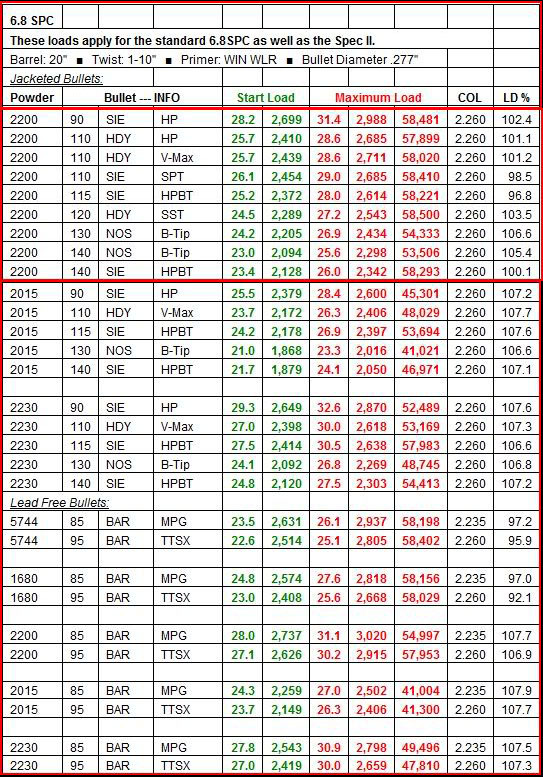 Here is Accurate Powder data that shows just how much more velocity is gained from using AA2200. It also had data for Barnes 85 and 95gr bullets at the bottom. I would send an e-mail to Western Powders and see of they themselves have a recipe for the 6.8. More good data, OV1. Its amazing to me that so many 6.8s came out with 1:10 or faster twist. That isn't needed for the lighter .277 bullets used in the 6.8mm SPC. 1:11 seems to reduce pressure and increase velocity. This will be a fun project. Brilliant data on the 68Forums OV1. They have done a magnificent job. It would be interesting to find similar data for the .243 Winchester. Vince, I think the .243 has been around so long its very stable and a know quantity. The 6.8 was born in the age of the Internet and this forum and the resulting colaboration helped resolve issues with chamber freebore, forcing cone, and twist rate. BTW, 6.8s must be getting pretty popular. MidwayUSA had a blemish bullet sale last week. I scoped out which one I might want and thought about it for a day. They were all sold out of every 6.8 bullet within 24 hours. mini 14s come out in the original .223 then the .44 was put out very similar then came the mini .30 in 7.62x39 and now the 6.8spc is in the line up. once Ruger put it out there it was sure to be a winner. I sure wouldnt feel undergunned with one for any animal we have in NZ. Found the load for my 6.8 SPC II. Its a PSA build with an 18" stainless steel light profile barrel. 29.3gr of AA2200 behind a 95 TTSX, Hornady Brass and CCI 450 primers. Accuracy was 1 MOA with a muzzle velocity of 2870 fps. I think that will do well for deer and hogs. Good stuff Slim. I love a happy ending.